Does building a city from the ground up sound exciting to you? Did you spend hours of your youth playing Sim-City? Guess what? You need to buy Suburbia. In Suburbia, you are given a tiny little town, with a park, a residential area, and a industrial area. Each round, you take turns with other players buying tiles from a central row. When you take one of these tiles, you can place it anywhere in your city, as long as it touches an existing tile. But this is where the game starts to shine, because each tile has effects that go off depending on what other tiles border it. Put your newly purchased landfill next to your residential area, and you lose reputation, but if you put it somewhere else, you just gain extra income. There are three main factors in the game. Population (score), reputation, and income. Income is easy, that’s how much money you make per turn. Reputation is how nice your city is. Each turn, your score is increased by your reputation, in addition to any direct population bonuses you might get from tiles. But with increased population, comes more problems, there are little red lines on the scoreboard. Every time you cross a red line, your reputation and income both decrease by one! Grow your population too quickly, and suddenly you will have a negative reputation, and start *losing* population on each turn. Turns out there is a delicate balance to building a city after all. The game is an absolute blast. Pick a tile, find somewhere for it to fit. Because the rules on placement are so simple (anywhere it fits), the strategy all comes down to you. The interaction of the tiles makes each decision important. If I build this elementary school here, I get a population bonus, but that will grow my population too fast, and then I’ll lose reputation. On my next turn, I wanted to build a landfill, but the only good place I have for it is next to the elementary school, oh, that won’t work, etc. etc. Some tiles even have special effects that work off other player’s boards. A hotel for example, gives you income based on the total number of residential tiles *in the game*. If another player has a ton of residential stuff built, suddenly that hotel is worth a fortune to you. Eventually, the stacks of available tiles run out, and it’s time to take final scores and see who won. There are goals, as well as secret goals, that make the final scoring more interesting, but there is also a moment of pride. Look at the big city you built, even if you end up losing, you had fun doing it. No dice, very low random factor. The only random part of the game is which tiles are available for purchase. Extremely strategic and “thinky”. Deciding which tile to buy is important, but just as important is deciding where to put it. Decent amount of player interaction with the tiles that react to other player’s boards, without any “hose the other guy” type of gameplay. Building a city is fun, stupid fun. Only 4 players. I think a fifth player expansion is unlikely. Sometimes a tile requires a lot of interaction between multiple players. At 4 players, it can be a little confusing, at 5-6 it would be a nightmare. The game ends too quickly sometimes. It’s so easy to get wrapped up in the building of your city, that you are disappointed you have to stop! The game plays equally well at any number of players. With two players, the cities tend to be a little larger, which can be fun. There is also less competition for available tiles. When playing 4 players, there are three players between your turns snatching up the tiles you wanted to buy, with two, you are much more likely to get the ones you want. It plays differently with two players, but not broken. It’s still equally challenging and fun. Buy it. It’s worth every penny. The components are of excellent quality, the theme is a blast, building a city is a hoot, and you will want to play it over and over again. Now that the obligatory Jefferson Starship/city building joke is out of the way in the title, let’s jump right into the game. 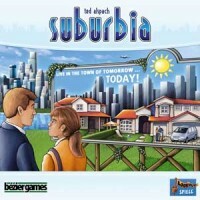 Suburbia is a game in which you develop a town by laying various types of tiles adjacent to each other. The tiles represent different types of development zones and buildings, and each offers different benefits or hinderances to income or population. The player with the highest population at the end of the game wins. Setup for the game can take a little bit. There are three types of tiles to be randomized and stacked on one board (labeled with an A, B, and C, respectively) along with some basic tile stacks, the “real estate market” needs to be set up, money needs to be stacked on another board, and the players need to place their starting setup tiles adjacent to their boards, as well as placing their income and reputation markers on their boards and their population marker on the population board. It’s not quite as bad as it probably sounds, but it can take a few minutes. Starting with the first player, players purchase a tile from the real estate market, which is where tiles are dealt face up from the stacks created in the setup. Tiles have a cost printed on them, with more powerful tiles generally being more expensive, as well as a cost modifier printed on each slot of the real estate market that gets added to it. The tile on the far left (the newest) has the highest modifier, which decreases as you go to the right until reaching $0, as which point you just pay the printed cost. You also have the option to purchase one of the basic tile types, though you must also pay the modifier’s cost to discard a tile from the market, as well. Finally, you can pay the cost modifier to take a tile and place it face down as a lake. Once a tile has been purchased, the player places it in his/her borough. The only placement rule is that the tile must be adjacent to an existing tile in the borough. When a tile is placed, the player makes any adjustments to their income and prestige levels, and then collects money equal to their income, and increases their population by the amount equal to their reputation level. These numbers can go into negative numbers, so it is possible that you will lose money or population at the end of your turn. When adjusting population, there are red lines on the board that, when crossed, penalize your income and prestige, so you don’t want to grow too much too quickly. Whether a tile was purchased or discarded, any tiles to the left of the removed tile shift to the right and a new tile is taken off the stack and placed in the farthest left space in the real estate market. When the A stack runs out, you start taking tiles from the B stack; when B runs out, you go to C; somewhere in the C stack is a tile that tells you to play one more round, after which the game ends and final scoring begins. If this sounds simple, it is. The complexity of the game comes from building your city in an optimal way. The tiles come in various zoning types. There are residential, commercial, industrial, and government tiles, and within each type, there are numerous individual tiles with individual effects. Some give a one-time bonus or reduction to income, reputation, or population, while others give a bonus or reduction based on how many tiles of a certain type surround it, how many of a certain type are in your town, or even how many of a certain type are in anyone’s town. Figuring out how to develop your city in order to maximize the bonuses can be quite challenging. Further complicating things are the additional costs in the real estate market. There may be a tile that would fit perfectly in your city, but you can’t afford it or don’t want to pay that high of a price for it. While you’re waiting for it to work its way to the left, someone else may buy it or even pay to discard it just so you don’t get it. You also never know what is coming next, so what seemed like a great move might suddenly become a very costly placement mistake. Finally, the final element that complicates things is the presence of goals. That’s right. Goals. Some people love them, some hate them, and some just don’t care. None fo them are powerful enough to catapult someone into first if they haven’t been playing well up until then, but they are present in the game, so it is something you might want to consider. At the beginning of the game, each player is dealt two goals of which they keep one. This is their secret, personal goal for the game. There are also public goals that everyone can see and is competing for. When fulfilled, the goals give a population bonus at the end of the game. Whoever has the highest population at the end of the game wins. There’s a pretty low learning curve. It’s a game that is very simple mechanically, and can be learned pretty quickly, but still offers a lot of depth. The most difficult aspect to learn is probably remembering all of the things that have to be adjusted on each turn. The components are all very high quality. The tiles, coins, and boards are all made of thick, sturdy cardboard, and the player markers are wooden, though they’re a little on the small side. It’s a minor complaint, but it’s something. The first player marker even looks like a little skyscraper just to stick with the theme. Suburbia is a great game. It’s easy to teach, offers strategic depth, and has enough variety that games don’t really feel too similar. It feels very much like the board game version of the original SimCity with the different zones of predetermined sizes needing to be placed together in such a way that they work together. Really, my only complaints are that it’s a little too fiddly (move this marker, then move that one, and don’t forget about that one over there) and it seems like there is more room taken up by the tile and coin supply boards than players’ towns. All in all, those are obviously very minor complaints. Suburbia is one of those rare games that provides a great deal of depth with a fair amount of strategy and yet is still quite easy to learn. I’ve played two games now and, not counting the guy who taught the first, the six individuals (including myself) who played it had a good grasp of the rules by the second or third turn. The basic concept of the game is that the players are building a borough off of a major city. Their goal is to develop an area that attracts the greatest population (and money never hurts too). This is done through the placement of hex tiles, each of which represent a specific type of structure (e.g. fancy restaurant or municipal airport) and falls within one of four different zones/types (business, residential, industrial, civic). The tiles are built off of your player mat, which also includes a tracker for both Income and Reputation. The income tracker determines how much money you earn on your turn. However, you only earn money AFTER you build, so be sure to plan accordingly. Reputation determines how many points you get on the Population track later in your turn. The Population track is essentially the scoring track like any other game,.However it contains one little difference: along the Population track are red lines every so many points. Whenever you cross one, you immediately reduce your Income and Reputation markers by one to represent the fact that your borough has grown. Furthermore, the more advanced you get on the track, the closer those lines become. This serves as a really interesting mechanism to help keep explosive growth in check. Everyone starts off with the same three tiles and builds from there. There are three separate stacks of semi-unique buildings (A,B, and C) which get progressively more expensive (and powerful) throughout the game. There are also some very short stacks of those same three building types that you start with. The A (then B, then C) stacks are used to seed what’s available along the planning track. The first two slots one can buy at face value (every tile has a different cost). However, if you want, you can also buy tiles further up the track by paying their face value + a specified amount on the track. I like to think of this as a “donation” to someone in the planning department for getting your permits approved more quickly. Once you you have a tile, you place it adjacent to another tile in your borough. You then go through a quick determination to see how that tile affects your Income and Reputation. These effects range from one-time effects, to those adjusted by tiles that are adjacent now (and in the future), There may also be effects on tiles based upon what other tiles that are in your borough, though not necessarily adjacent and even some that are adjusted based upon every single player (for example, airports adjust depending on how many are in play). This may sound like a lot of checking, and there’s a summary card for each player explaining the steps to follow if you’re not sure. However, it actually goes quite quickly. The vast majority are adjustments from single-use and adjacent tiles. I should also point out that not all adjustments are positive. For example, airports give you a negative reputation based upon the number of residential tiles adjacent to them – apparently people don’t like to live near airports. Same goes for the landfill (though it does bring in money). These are just a couple of examples, but I really felt that every single tile was representative of what a real life structure would be like. One other option for building is that you can turn over any tile you take and “Lake” it. You are converting that land to a lake. Lake’s provide no bonus beyond money based upon adjacent tiles. This can be a quick way to raise some cash. It can also be a nasty “take that” to someone else when you take the tile you know they want, though I wouldn’t normally recommend doing this unless you don’t have a better option or a specific strategy. A third option is to Invest. This means taking one of your three investment tokens and placing it on one of your established buildings. You pay the cost of the building again, but you reap its adjustments a second time and that doubling stands for the rest of the game. Once you get going, this can be very helpful if properly placed. Finally, the tiles are adjusted down the track to fill the vacancy and a new tile is drawn and placed at the top. Even if you invest or take one of the three basic tiles, one of those on the planning tracker gets discarded to make sure there’s always a hole to adjust in to. One last thing to mention in the game are the many goals. These can provide big bonuses at the end of the game if you are the only player to meet that goal (e.g. fewest industrial tiles or most contiguous civic buildings). Everyone starts out with a hidden goal and there are a four public goals. Game play generally moves quickly. Expect it to take longer for players new to the game as they will have to read each and every hex. There is also the risk for Analysis Paralysis, though I often suffer from that myself and yet I don’t find it to be too problematic in this game except, maybe, for the final turn. I see this game as having a good amount of replay value. As you learn the tiles, you will like move along faster, but I see that as beneficial as it allows one to plan better since you know what could be coming down the pipe. However, not all tiles from the A, B, and C groups are put in the game, so this also helps with keeping things fresh. And, of course, there are far more goals available than used in any given game. The quality of the components is good. There’s nothing here beyond typical cardboard and a few wooden bits. I did have a couple of coins that required some careful punching to avoid ripping the paper, but that’s typical for any game. The manual is easy to read with lots of examples that I found easy to follow. There’s also a separate summary sheet for those buildings that are a bit more tricky. We had one come up and the summary was very well written on how to apply the rule and covered all possible circumstances that might come up. Graphic design of the game is decent. The layout on the hexes follows a specific design to aid the reader in quickly understanding what that tile does. Each of the four zones has a unique color for quick identification. There are a few icons that one needs to learn, but they aren’t terribly difficult to pick up. In conclusion, i must admit that when I first heard about Suburbia, the concept and the box art didn’t entice me. However, I am so glad that I tried it. I ended up having a great time on my first play and it immediately earned a rare spot on my Actually Going To Spend Some Money And Buy A Game List. As much as I love board games, I just don’t have the time and justification to purchase them often. But from my experience, I’ve seen gamers both heavy and light really take to this one. And that’s a rare combination and worth the investment. I was very excited about playing this game. I love Sim City and strategy games in general. I played with my game night group a few days ago, and I was amazed at how well this game reflects actual city planning (or at least what I know of city planning from Sim City). My friends all jumped out to a huge lead over me, but I had a plan. I know that growing too quickly can easily kill a growing city, and I trusted that slow and deliberate growth would win out. I was so right! By the 5th round or so, my friends cities were overpopulated and were going bankrupt. This game offers a lot of variety due to randomization of building that are available, and the time between turns is amazingly short. I liked this game very much! So once again, they have chooses a game to explore that does not have enough reviews. I have read them here and watched the video and this looks like a good game. Good quality tokens and pretty easy to understand! It’s an easily a Critical Hit, creating a city and managing it is one of the things that I like to do for fun, and Suburbia implements it in a way that makes sense for a mid-weight board game. It doesn’t have the depth of Cities: Skyline, or Planet Coaster but does enough to scratch that itch. If you were me, you’d buy Suburbia right now. Thankfully, for both of us, you’re not. Leaving a question only you can answer, is this the right board game for you? Add a Review for "Suburbia"